– Flatten the ball of snow skin into a thin circle. – Place the ball of filling in the center of the dough and seal the filling with the snowskin dough. – Put the ball seam-side up into the floured mold and pack it in gently. – Flip it over onto flat surface. 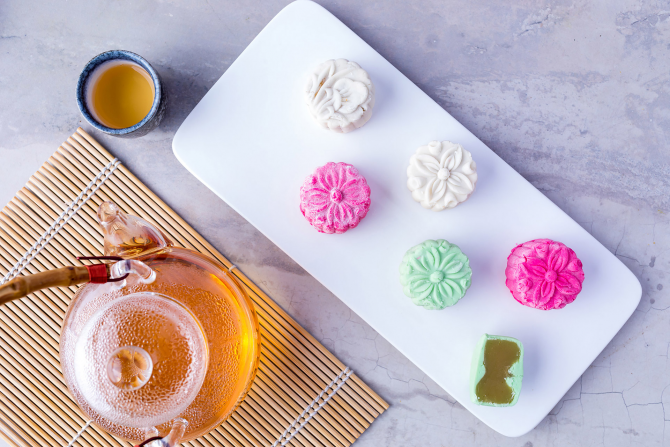 – Press down hard on the lever of the mooncake mold, so that the mooncake shape is formed and the face plate makes an imprint on the top of the mooncake. – Then squeeze to release and your mooncake. – Repeat with remaining dough. Chill for six hours before serving. Step 4: Plate and serve! Serve cold and slice into smaller pieces to show off your different fillings.